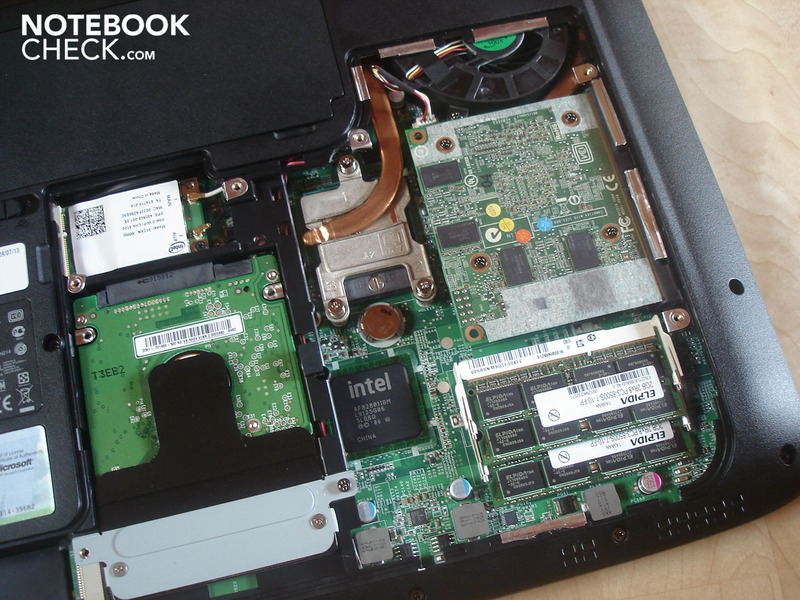 Entertainment notebook with gaming ambitions. 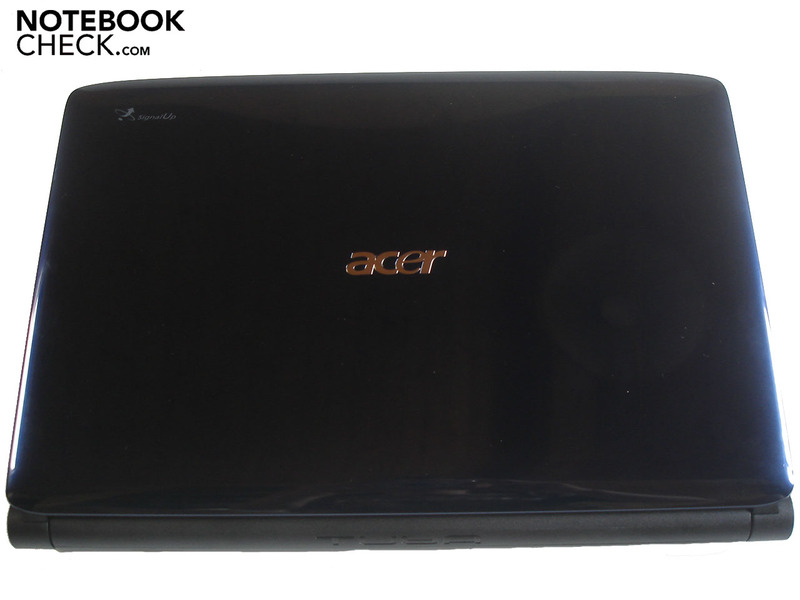 With the Aspire 5739G Acer fields a 15.6-inch entertainment notebook, which could at the same time pass for a gaming notebook with its Intel Core 2 Duo P7350 and the brand new Geforce GT 240M. Whether the Aspire 5739G manages the balancing act, or whether none of the two demands can be adequately met, read in our extensive review. At present several models of the 5739G range are vying for consumers' attention. 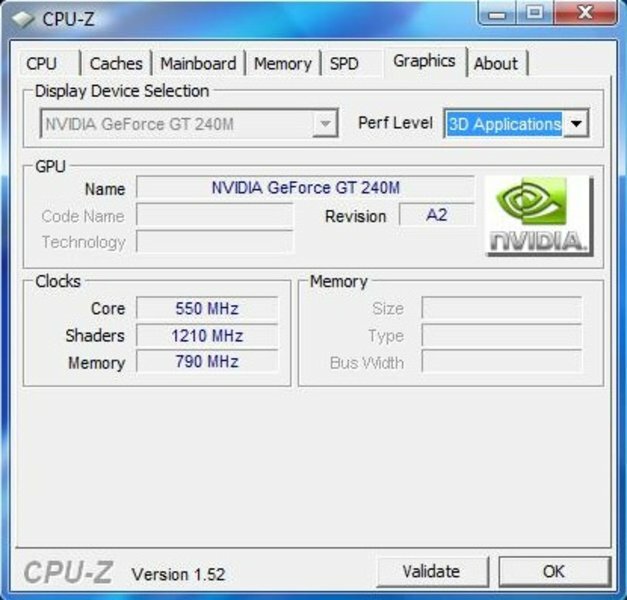 Above all two models stand out, as they possess the new and relatively high-performance Geforce GT 240M graphics card. 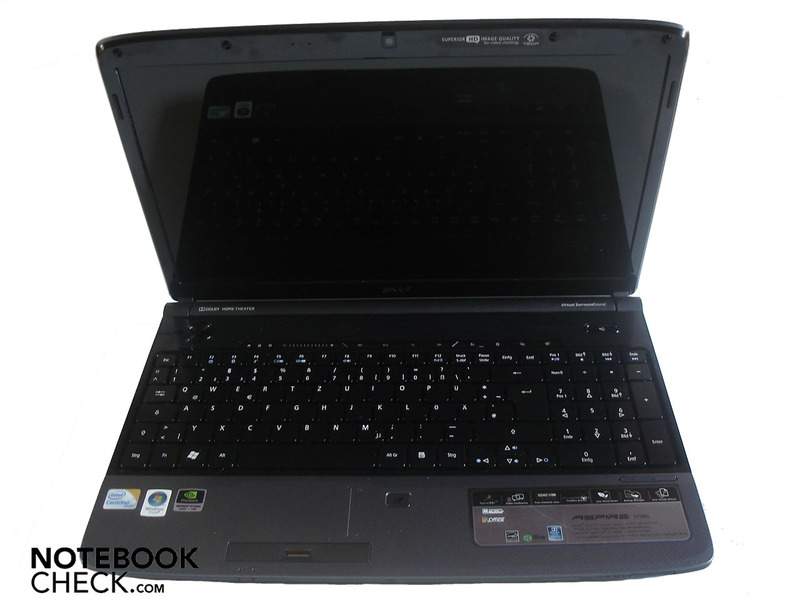 The Aspire 5739G-664G32Mn is already to be had at a price of around 700 Euro and offers a good price/performance ratio in combination with a Core 2 Duo T6600 (2.20 GHz). We have opted for the version 5739G-734G32Mn. This possesses alongside the mentioned Geforce GT 240M a Core 2 Duo P7350 (2.00 GHz) and goes over the counter at a price of around 800 Euro. 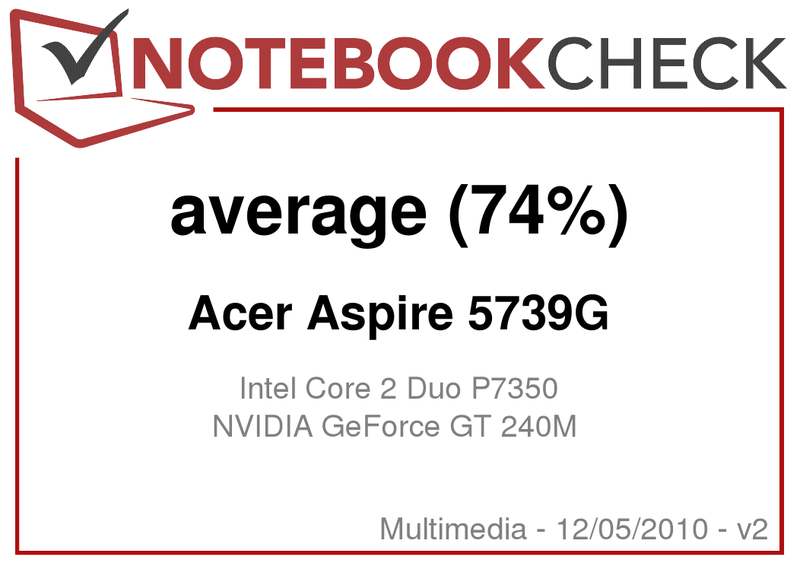 As an alternative to the following review, there is also a first hands-on report of the Aspire 5739G available. The 15.6-inch case has a size of 372 mm x 262 mm x 39 mm (width x depth x height) and brings a weight of an orderly 2700 g onto the scales. When it comes to colour the case is well accentuated. Thus the display lid is presented in a fancy dark blue. As the lid is high-gloss finished, unfortunately clear fingerprints remain on the beautiful surface and after only a short time fingerprints are all that's left. 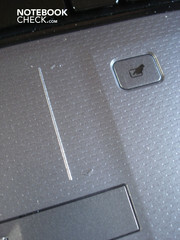 The inner side of the display lid is presented in a black high gloss and to that effect becomes dirty just as quickly. 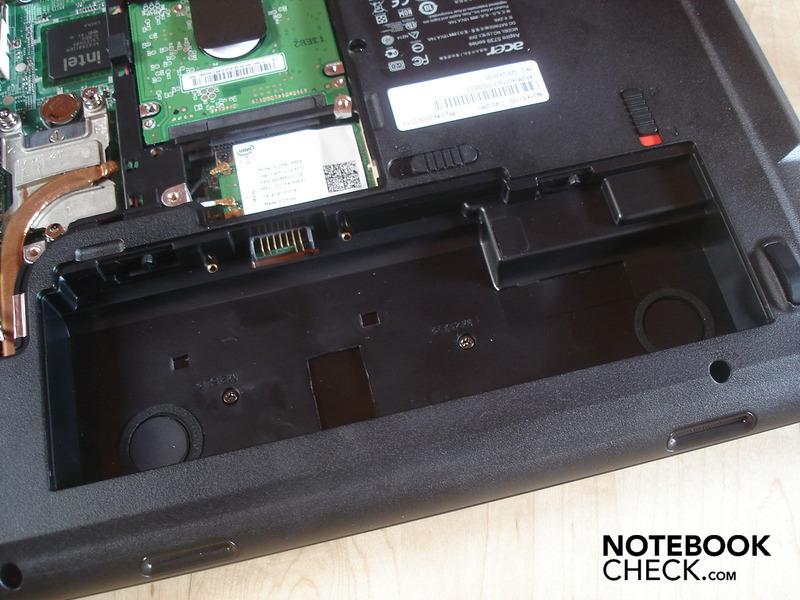 The rest of the notebook is finished in a matte, black plastic and thus doesn't necessarily seem high-quality on closer inspection. Above all the grey palm rest, which is also made of plastic and is branded with a texture of fine stripes, makes a less premium impression and stylistically it really doesn't want to fit in with the rest. 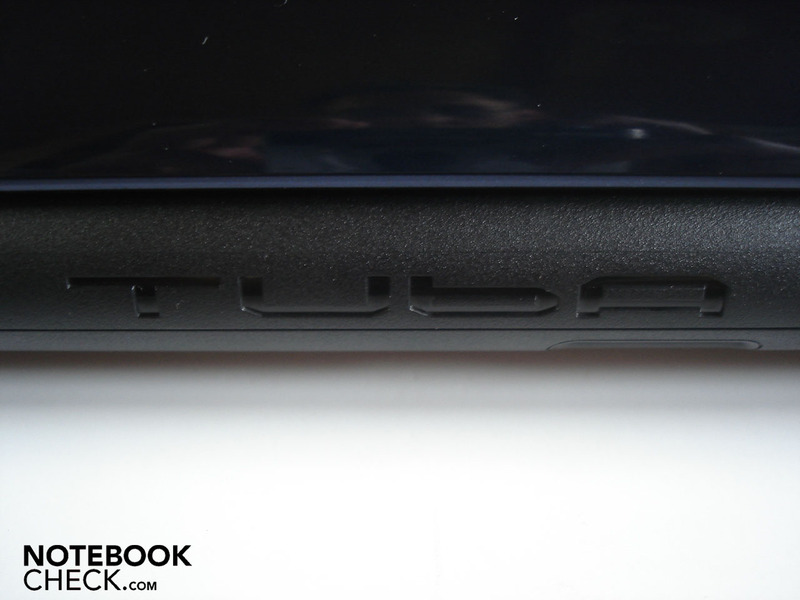 Furthermore the thick "Tuba"-subwoofer comes in luxuriantly, which takes up the complete width of the rear side. 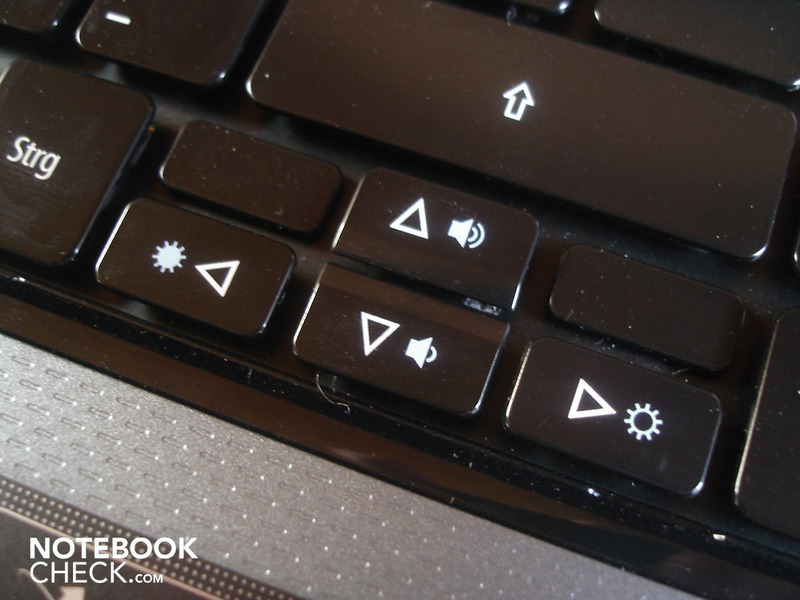 The integrated touch-sensitive hot keys are presented subtly, and just like the large power key, which stands out with a blue illumination, it is very fancy. Relating to the stability there is relatively little to criticise. Thus a strong force on the display rear leads to slight image distortion of the panel and also the rest of the case gives way somewhat here and there, however this is never disturbing. The thick hinges are stable and hold down their job pleasantly quietly as well as reliably. 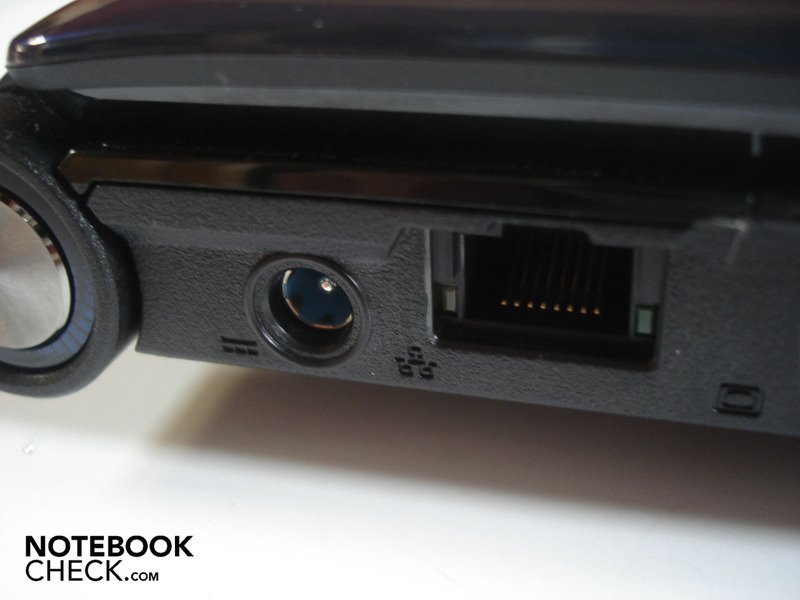 As for the connections and the connection possibilities Acer is generous, because apart from a FireWire port, almost everything that the heart desires is at hand. The majority of the connections are situated on the left side. Alongside the obligatory power supply a RJ-45 Gigabit LAN port sits here. 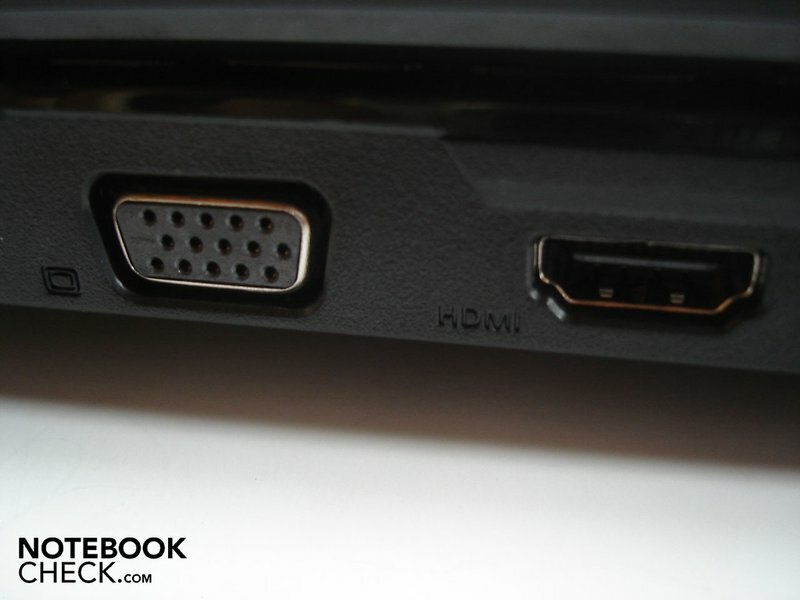 In order to connect the 5739G with external monitors, a VGA- and an HDMI output wait alongside. 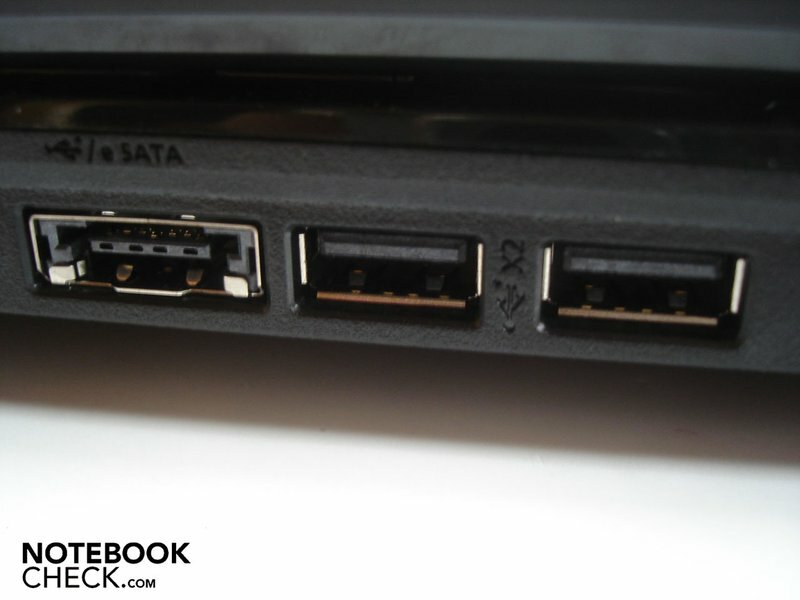 After that alongside an eSATA/USB 2.0 combo there follows two further USB 2.0 ports. Finally situated on the left-hand side there are still three sound jacks and even line-in, a microphone input and a headphone output. 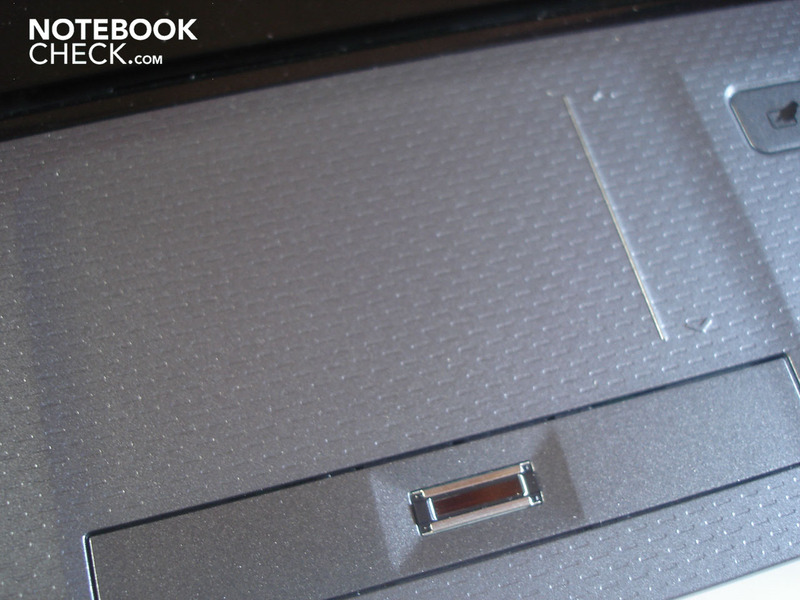 On the front side there is a centrally placed inconspicuous infrared sensor and on the right, a 5-in-1 card reader, which handles the formats MMC, XD, SD, MS and MS Pro. 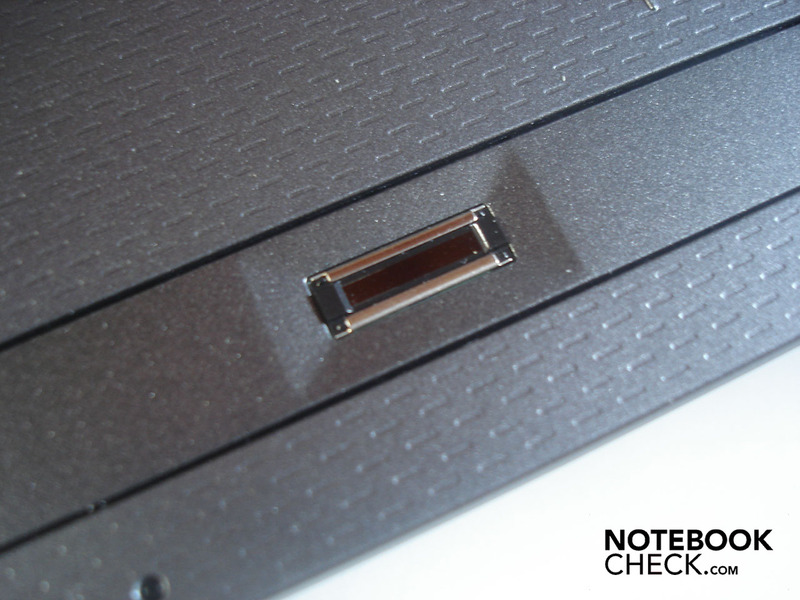 On the right side of the case awaits a USB 2.0 port which is positioned rather far ahead. Thus the 5739G has a total of four USB 2.0 ports, a convincing number. 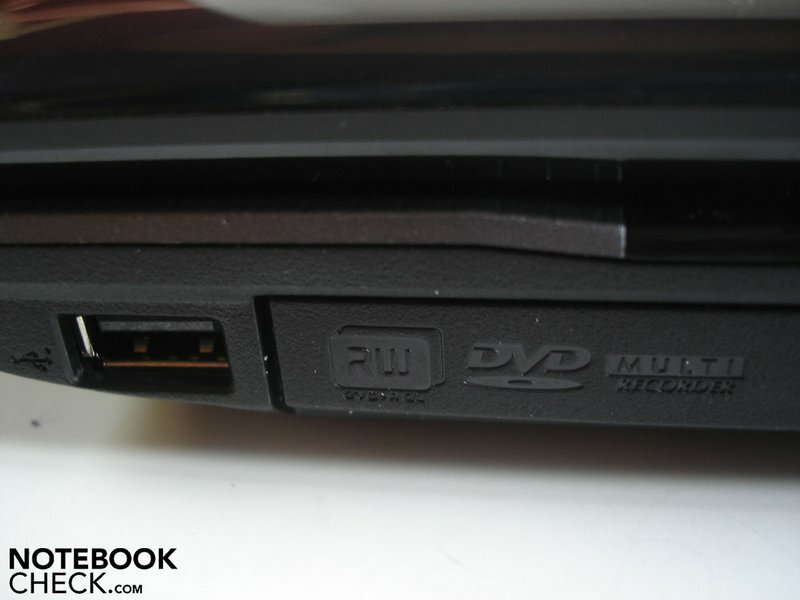 After that follows a multi-format DVD burner and an antenna input which is locked by the manufacturer and thus is not usable. A RJ-11 modem port and a Kensington Lock conclude. 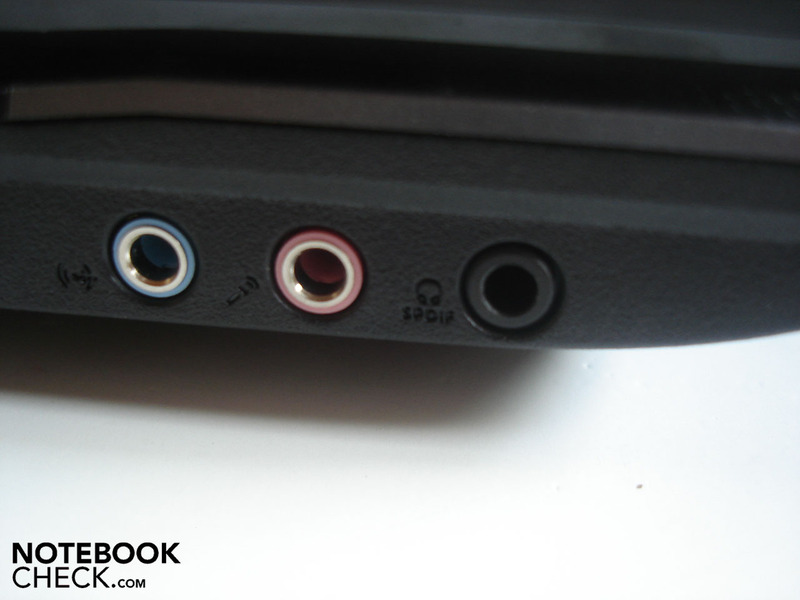 The rear side is however free from connections, as the complete width is engrossed by the thick "Tuba"-subwoofer. The positioning of the connections has really pleased us on the whole, as most and the most important cables can be uniformly connected on the left side. For left-handed people this factor could however be rather annoying. Whoever would rather plunge into the depths of the internet wirelessly will be pleased by the integrated Wlan 802.11 a/b/g/n. The touch-sensitive bar even has a button for Bluetooth, however on our test model there was no integrated Bluetooth support. Apart from that the 5739G even gets an integrated microphone, a high-definition webcam (resolution 1280 x 800 @ 30 fps) and a fingerprint reader, which is positioned between the two keys of the touchpad. 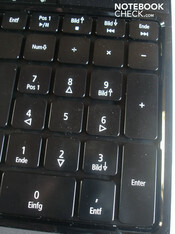 The keyboard is for the most part presented in a standard layout and comes in a black high-gloss design. Thereby the keys are on the one hand relatively slippery, which surely won't please everyone. On the other hand the keys become really dirty very quickly. 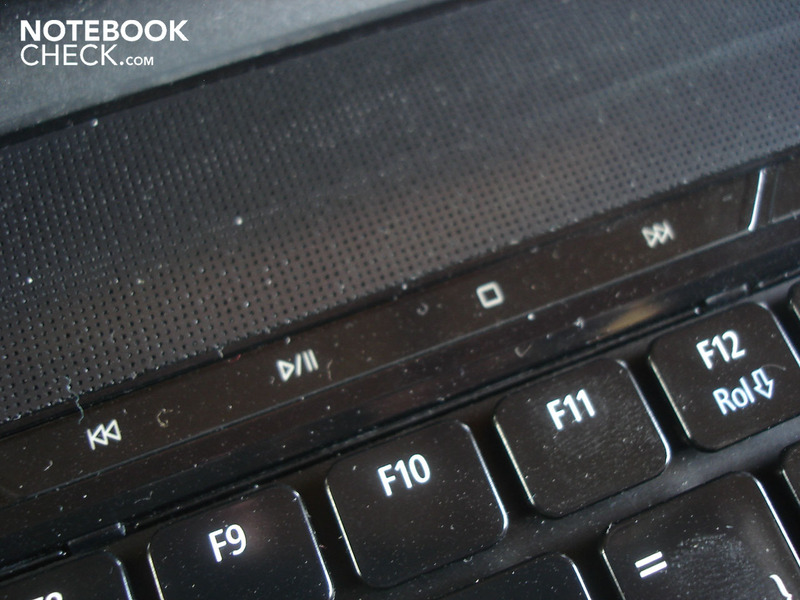 The keys have a pleasant size, apart from the much too small arrow keys, and also the good pressure point could convince us. 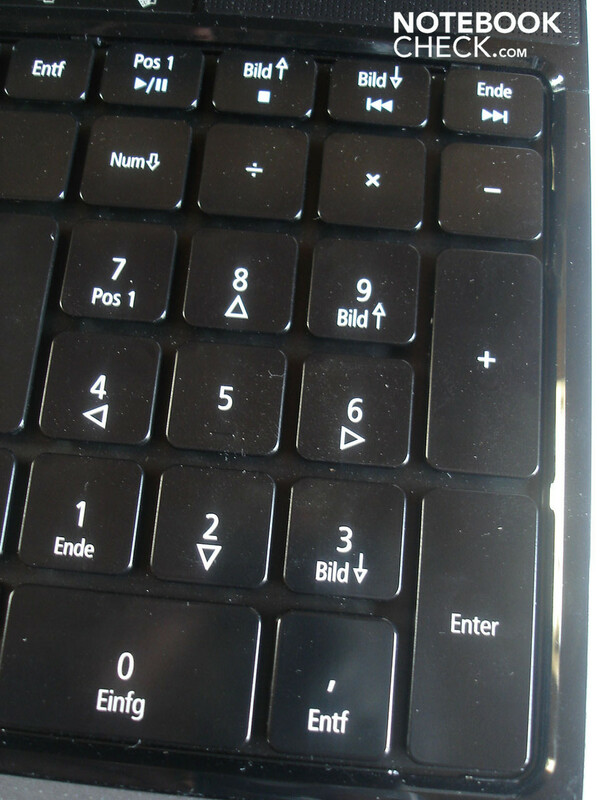 The stability of the keyboard is orderly on the whole, whereby the numberpad comparatively strongly gives way even from low pressure, as the DVD drive is situated underneath it. However, the touchpad really wasn't convincing. Thus the surface is on the one hand relatively course, on the other hand the texture of the palm rest makes for a subjectively unpleasant gliding feeling. 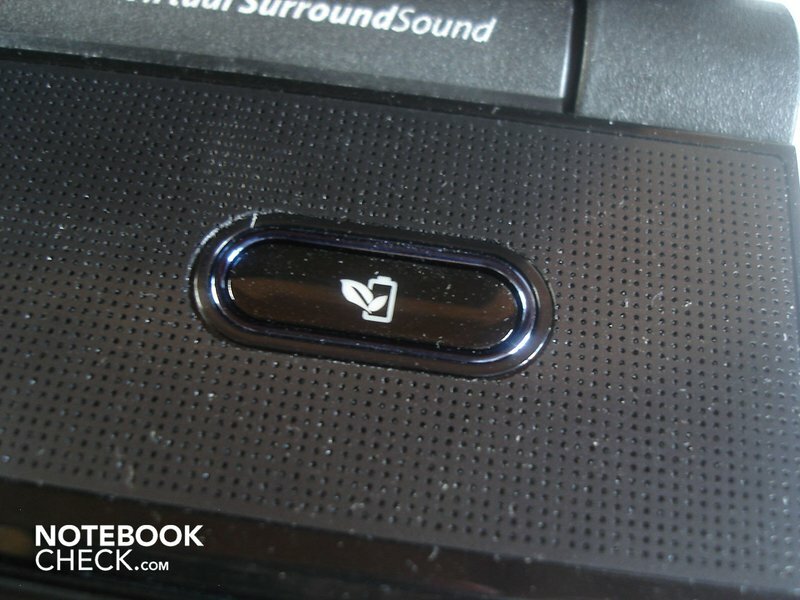 Alongside this the touchpad even handles various gestures, yet these are more often accidentally activated. In normal use the touchpad was at least very precise. 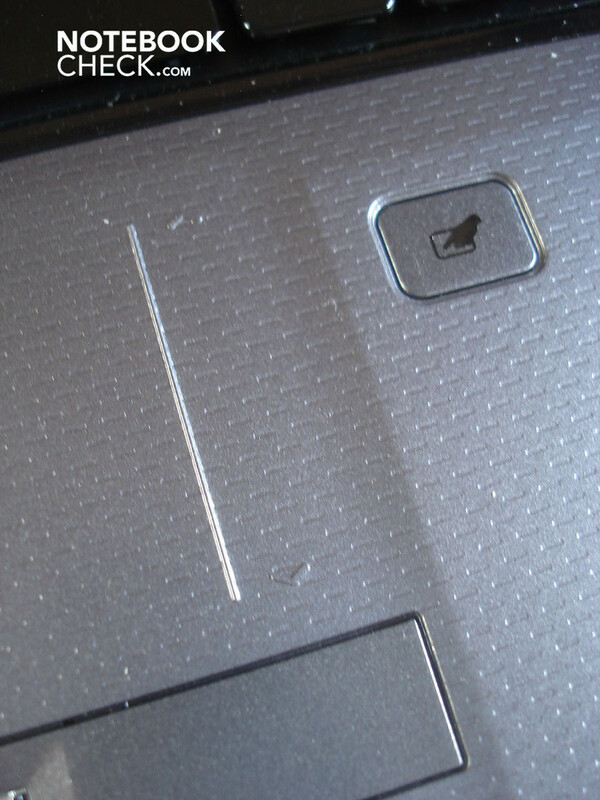 Both of the grey mouse keys are made up of a non-stop bar and are as usual fitted under the touchpad. 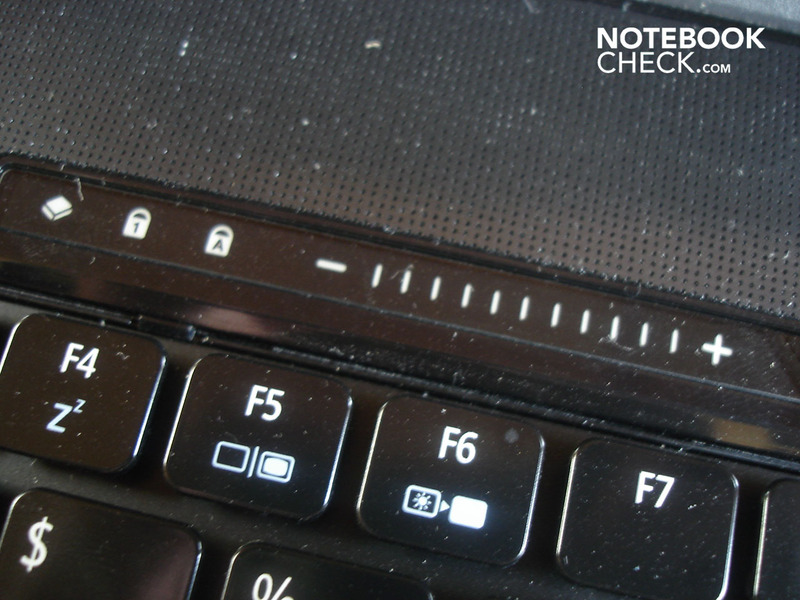 The mouse keys indeed have an orderly pressure point and also acoustically impart a good feedback, yet in particular the left key was too sluggish. As a display Acer adopts a 15.6-inch HD panel with a resolution of 1366 x 768 pixels. As this has LED background illumination, we were hoping for a good picture quality. Yet unfortunately the 5739G disappoints to that effect. Thus the average brightness amounts up to an average 168.6 cd/m², which subjectively expresses itself in a comparatively pale image. As the contrast ratio only adds up to 149:1, the image appears moreover really low in colour. The black level of 1.18 cd/m² makes the matter not much better, rather dark scenes turn out negatively. Solely the illumination at 87% is convincing. As the display dons a silvering, you are already not protected from unpleasant reflections in bright indoor rooms. As additionally the brightness of the panel, as mentioned, turns out rather averagely, outdoor use is barely contemplated. Even in shadows you can recognise almost nothing else and it really quickly ends up in eye-ache. The viewing angles are, especially in the vertical field, rather meek. For a mobile entertainment notebook what's offered is definitely too little, in stationary use however you can still live with it. 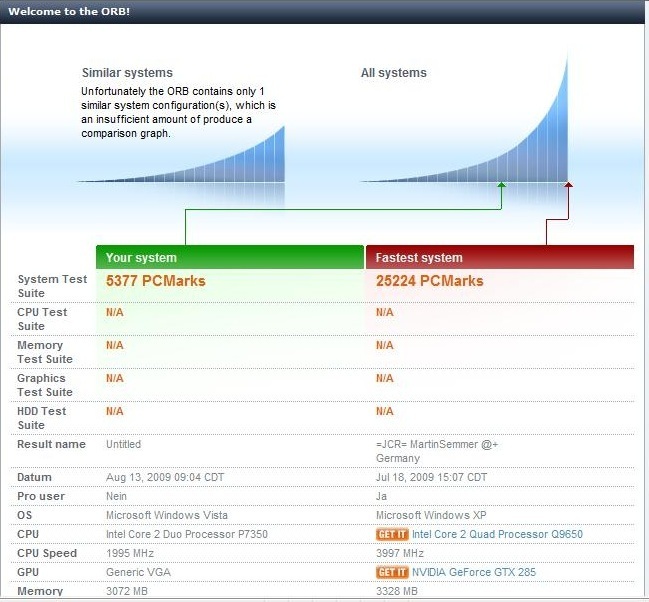 Regarding CPU Acer has gone for a model of the upper middle class, namely the Intel Core 2 Duo P7350. As the P in the name gives away, the maximum energy consumption adds up to a low 25 Watt. 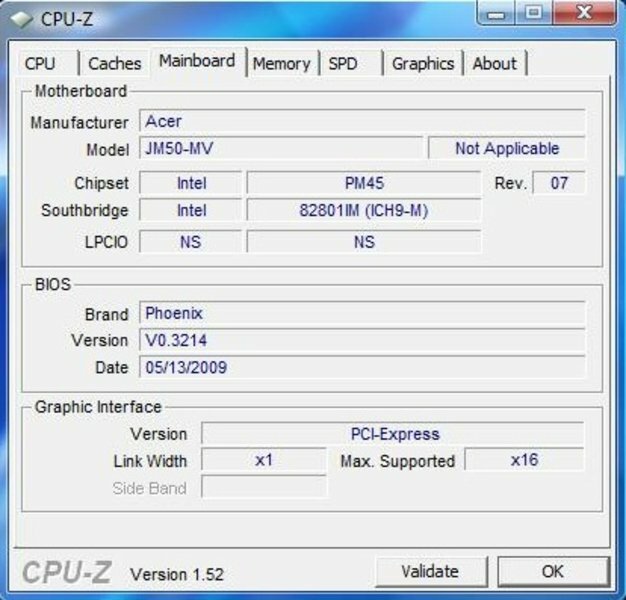 Furthermore the P7350 is indeed relatively low-clocked at 2.00 GHz, however the Acer makes up for this factor partly through its high FSB of 1066 MHz and ample three MBytes of L2 Cache. 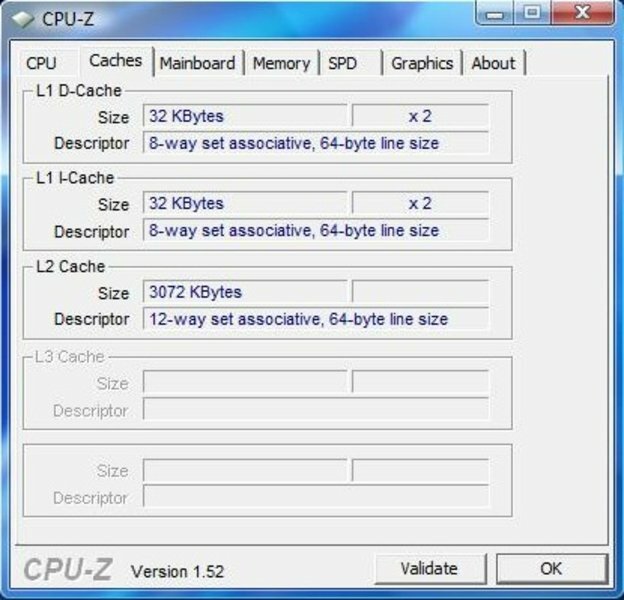 On the Intel PM45 Chipset there is furthermore 4 GByte of DDR3 main memory at 1066 MHz (a maximum of 4 GBytes is possible, both RAM slots are already occupied). 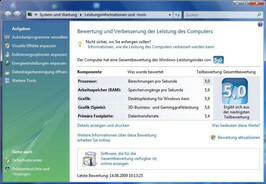 Due to the 32bit operating system (Windows Vista Home Premium), however, only around 3 GBytes are available. 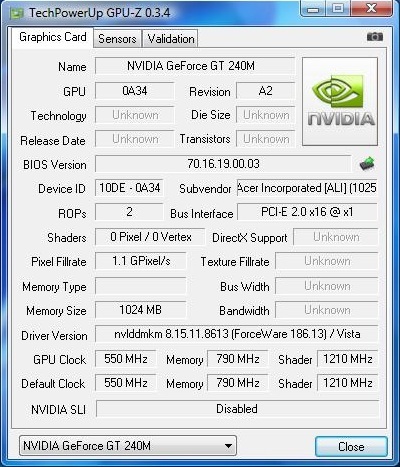 As for graphics card Acer has put in a brand new and thereby interesting candidate in the 5739G with the Geforce GT 240M. 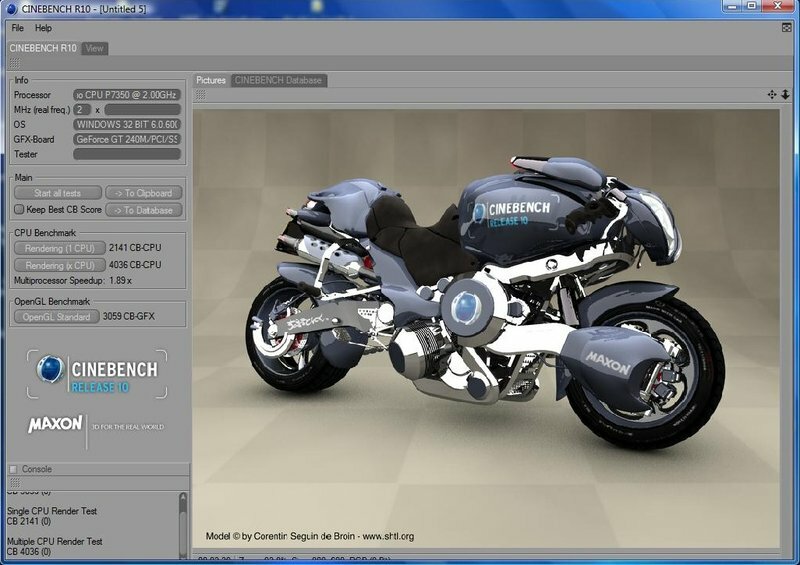 The DirectX 10.1 capable GT 240M has 48 shader units, an ample 1 GByte of DDR3-VRAM, 128bit memory bus and runs at a clock speed of 550 MHz (core), 790 MHz (memory) and 1210 MHz (shader). Via the PureVideo HD (VP3) technology the GT 240M in addition supports the computation of high-resolution video material. Theoretically this graphics card of the upper middle class should rank between the relatively new Geforce GT 130M and the time-honoured 9700M GTS. 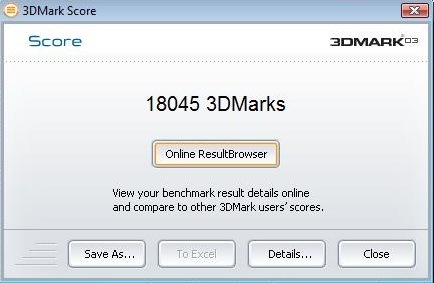 We will shortly show how the result turns out practically in the gaming benchmarks. 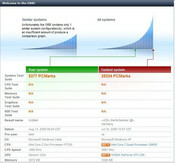 However, the comparison to a competing card from ATI, the Radeon HD 4650, is interesting. Let's start with the CPU-oriented benchmarks. In Cinebench R10 the 5739G reached 2141 points on single-core rendering, 4036 points on multi-core rendering and 3059 points on the OpenGL benchmark. 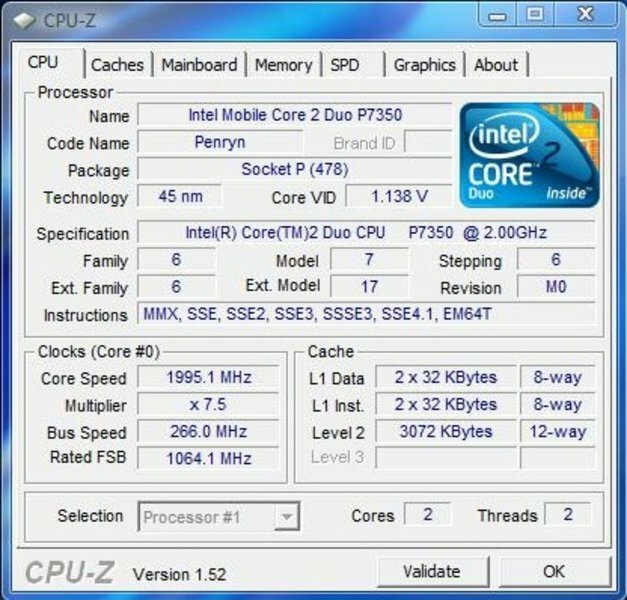 An Intel P8400 at 2.26 GHz, which also has 1066 MHz FSB and 3 Mbyte L2 cache, reaches in comparison 2800 points on single-core rendering and 4687 points on multi-core rendering, which is around 31% and respectively 16% better. In PCMark 05 it was then 5377 points for the 5739G. 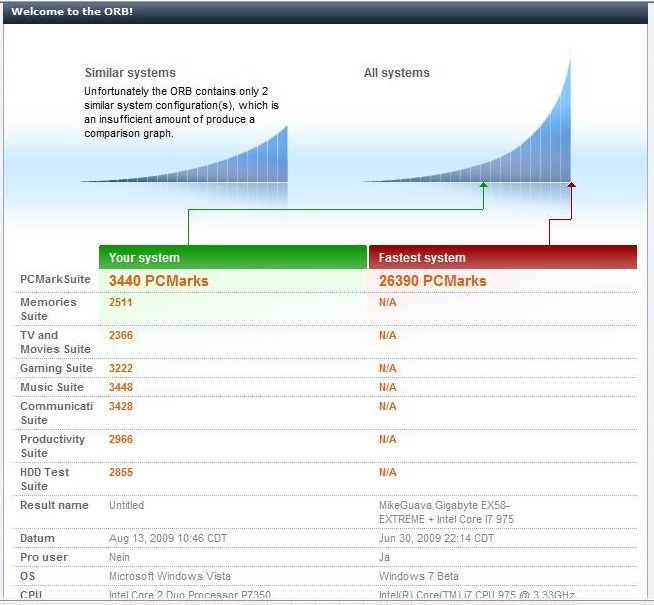 In PCMark Vantage it reached an overall good result at 3440 points. Well now we come to the GPU-oriented benchmarks. 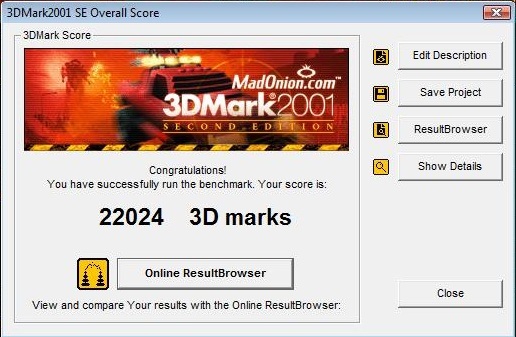 Starting with 3DMark 01 a very good result was achieved by the 5739G with 22024 points. In 3DMark 03 it was still convincing with 18045 points. In 3DMark 05 it was sufficient for 11419 points, whilst in 3DMark 06 it showed a result of 5837 points. 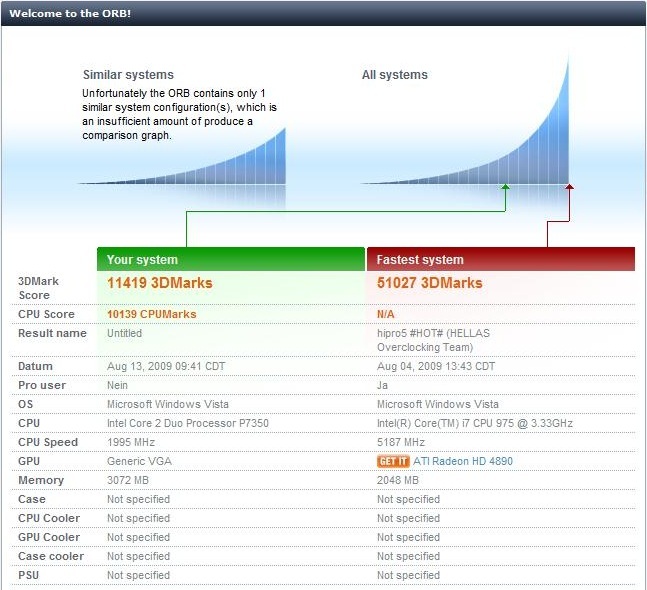 As the GT 240M possesses PhysX support, we carried out the 3DMark Vantage once inclusive and once exclusive of PhysX. 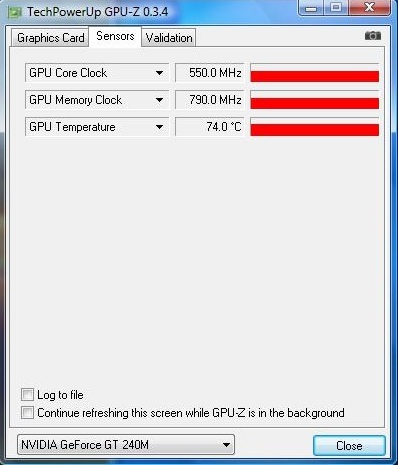 With activated PhysX the 5739G reached 2624 points (2078 GPU, 12353 CPU). Without PhysX it was still good with 2348 points (2080 GPU, 3825 CPU). 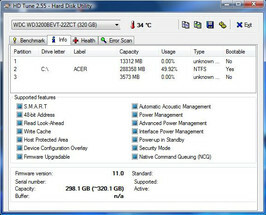 As for hard disk a 320 GByte hard disk from Western Digital serves, running at 5400 rpm. 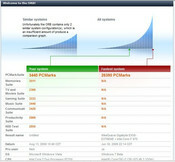 We established its benchmark value with the tool HDTune. Here the average transfer rate was at a middle field 52.0 MB/s, whereby the minimum value amounted to 29.7 MB/s and the maximum value add up to 65.6 MB/s. The access time turns out orderly at 17.6 ms as well as the throughput rate of 82.4 MB/s. 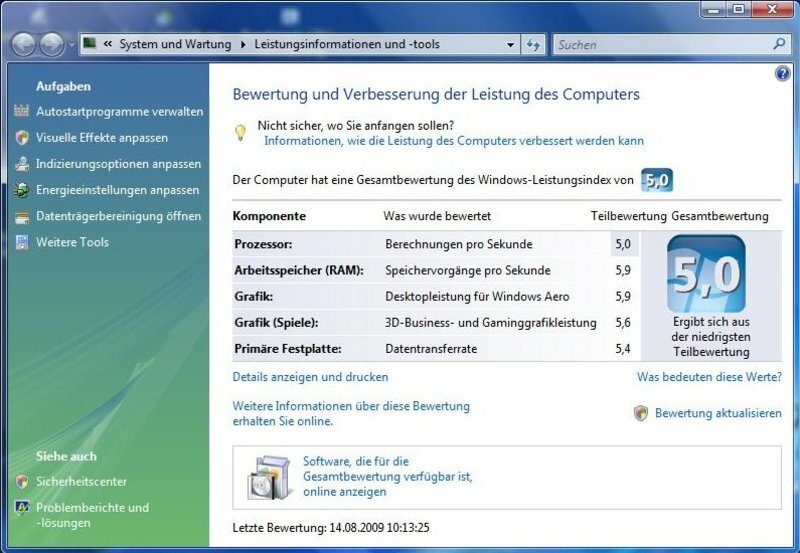 In the Windows Vista performance index the 5739G reached 5.0 points for the CPU, 5.9 points for the RAM and graphics, 5.6 points for gaming graphics and 5.4 points for the hard disk. As the worst value defines the overall rating, the 5739G here comes to a good overall score of 5.0 points. 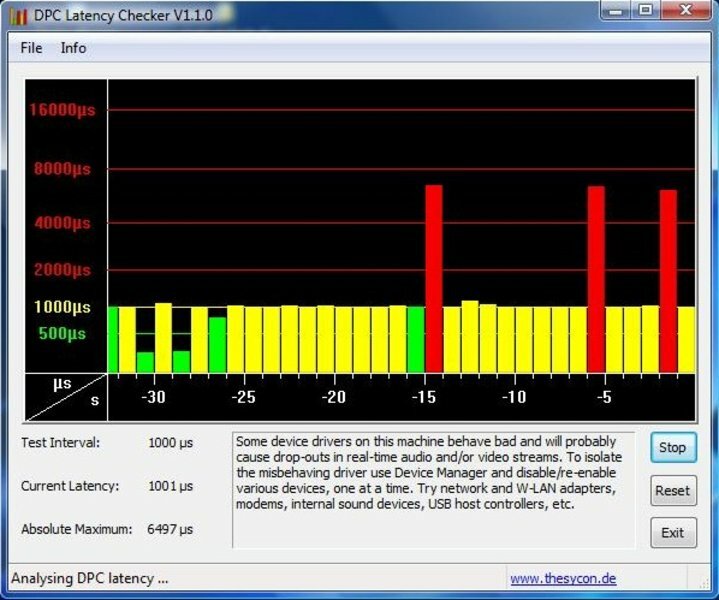 With the tool DPC Latency Checker we even checked the latency on Windows. This indeed mostly amounted up to around 1000 µs, but it partly jumped up to 6500 µs. Thereby it can lead to problems connecting external devices with the synchronisation e.g. sound cracks on external sound cards. 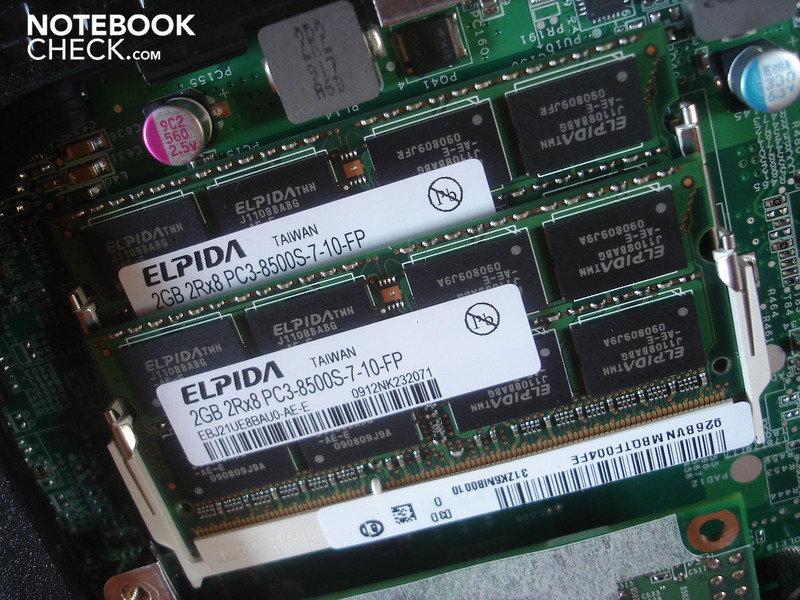 Overall the application performance is very good for an entertainment notebook of this price class. 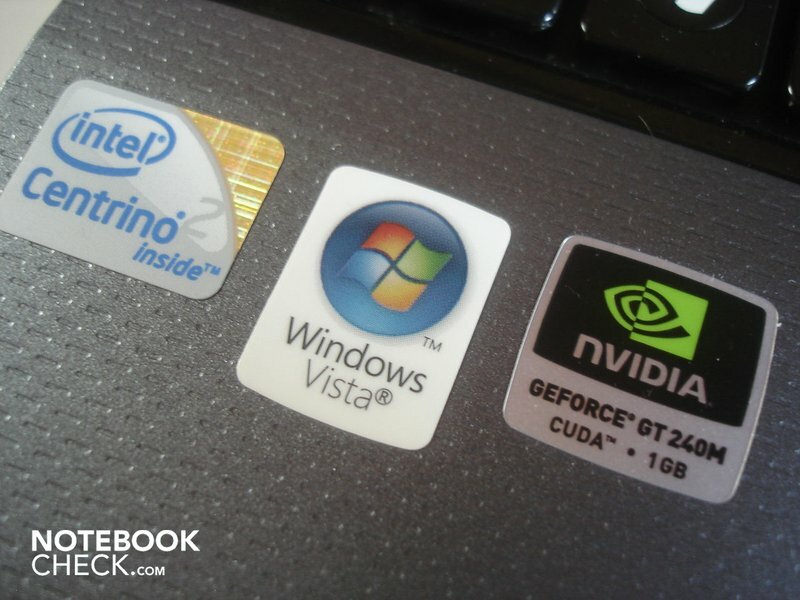 However you have to purge the system for now, currently just like on many other brands, of numerous superfluous pre-installed programs and tools, through which the notebook unnecessarily forfeits performance. As the Geforce GT 240M also promises good gaming results, we have designed the benchmark run-through to be extra comprehensive. In case it's not stated, the deployed resolution was 1024 x 768 pixels. Valve's Source engine is by now getting long in the tooth and hence poses no challenge for the 5739G. Thus CSS ran at 204.6 fps and HL 2 at 126.0 fps in each case at high details butter-smooth over the display. 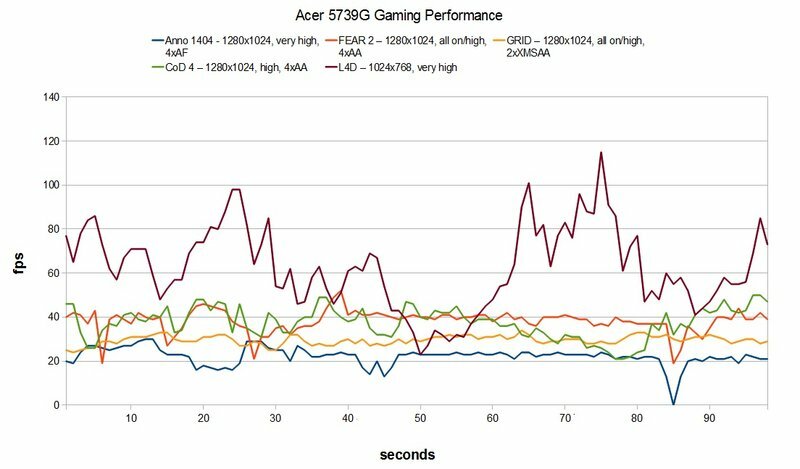 Even the indeed rather aged, yet still performance hungry Call of Juarez poses no big problems for the 5739G. Even inclusive of high details, DirectX 10 and 4x AA the benchmark ran with an average of 35.6 fps, which was surprisingly fluent. 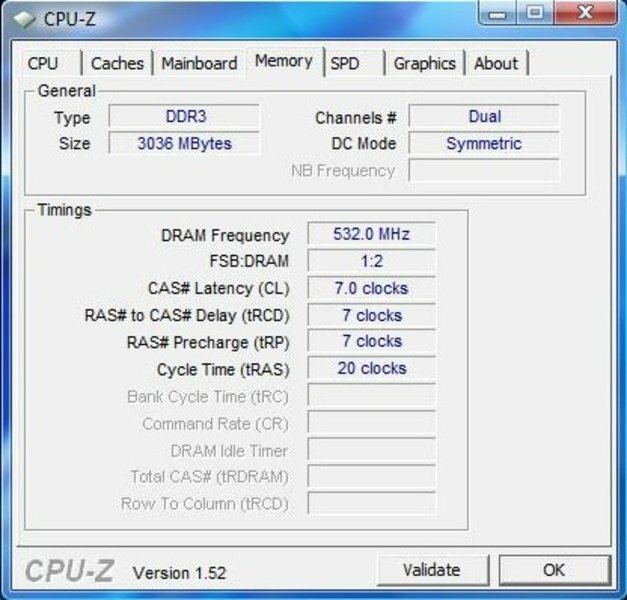 A Radeon HD 4650 is at 33 fps minimally slower in CoJ. However what is Call of Juarez in comparison to the top dog Crysis. Here it is quickly shown what a graphics card is capable of performing. At low details the notebook reached 50.1 fps in the GPU benchmark and 54.7 fps in the CPU benchmark, which are very fluent results. At medium details it was then still playable at 32.3 fps in the GPU benchmark and 34.0 fps in the CPU benchmark. At high details the GT 240M was then actually overstrained and clearly juddered at 21.2 fps in the GPU benchmark and 17.0 fps in the CPU benchmark. Even on Crysis the graphics cards from Nvidia obviously get the short end of the stick. Whilst a GT 130M and even a 9700M GTS run at high details with an average of 19 fps, the Radeon HD 4650 reaches a fundamentally better result of 29 fps. Left 4 Dead is indeed based on Valve's Source engine. This was however clearly upgraded for L4D and is for this reason more hardware-hungry than on CSS and HL 2. However the 5739G is not easily impressed here too. At low details and a resolution of 640 x 480 pixels an excellent 94.2 fps was inside. 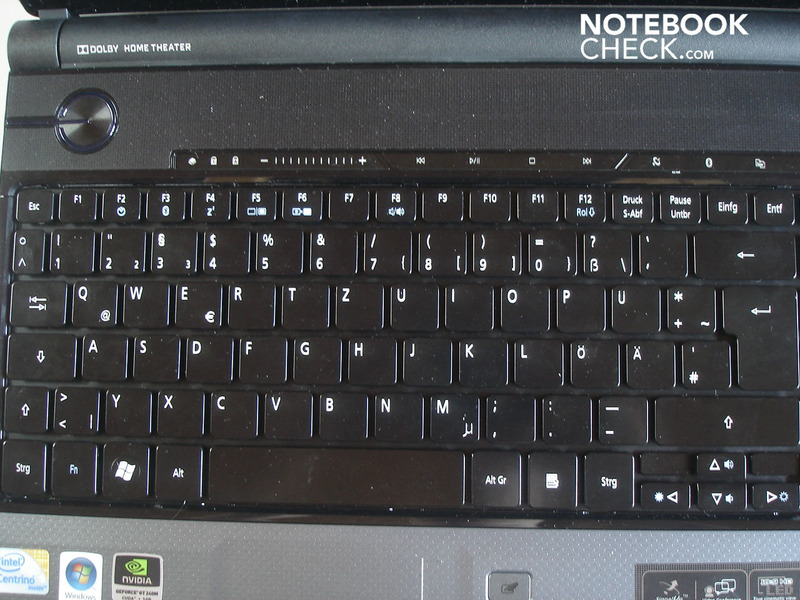 At very high details the notebook still reached a very good 66 fps. Also Fear 2 ran fluently at all times. Thus the 5739G broke the 100fps mark at the resolution of 800 x 600 and at low details with 118.5 fps. At medium details and 2x AA it was sufficient for 61.0 fps, whilst even high details at the resolution 1280 x 1024 and 4x AA were possible at 39.0 fps. A GT 130M is clearly slower at high details at around 28 fps and a Radeon HD 4650 is somewhat quicker at 43 fps than a GT 240M. The results in Call of Duty 4 turned out similarly. Thus Fraps showed an average of 143.7 fps in the resolution 800 x 600 and low details, whilst the tool displayed 66.5 fps at medium details. At the resolution 1280 x 1024, at high details and 4x AA it was still sufficient for a good 37.6 fps. A GT 130M is again clearly slower at high details at 25 fps, a Radeon HD 4650 slightly quicker at 43 fps. Race Driver Grid claimed somewhat more of the entertainment notebook. At low details and the resolution 800 x 600 a fluent gaming experience was still possible at 56.1 fps. Also at medium details Grid ran well with an average of 40.4 fps. A resolution of 1280 x 1024, high details and 2x MSAA however "only" made for an almost fluent 29.7 fps. It's a similar picture for the GT 130M, which is clearly slower at an average of 23 fps. 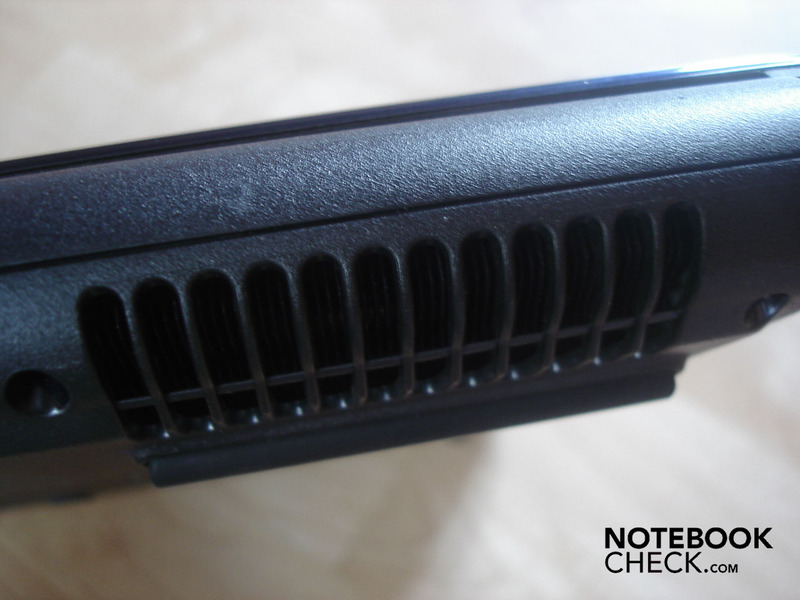 A Radeon HD 4650, however, wanders off at high details with a fluent 40 fps. The brand new Anno 1404 yearns for our test subject above all at very high details, a resolution of 1280 x 1024 and 4x AF. Thus the 5739G juddered along bouncily with an average of 21.8 fps. At high details, however, according to our measurements a relatively fluent gameplay was possible. Low details, however, flew over the display with an average of 79.5 fps, which was fluent at all times. On the whole the Geforce GT 240M makes for a surprisingly good gaming performance. Almost all tested games were fluently playable in high details and often even with various image enhancements. 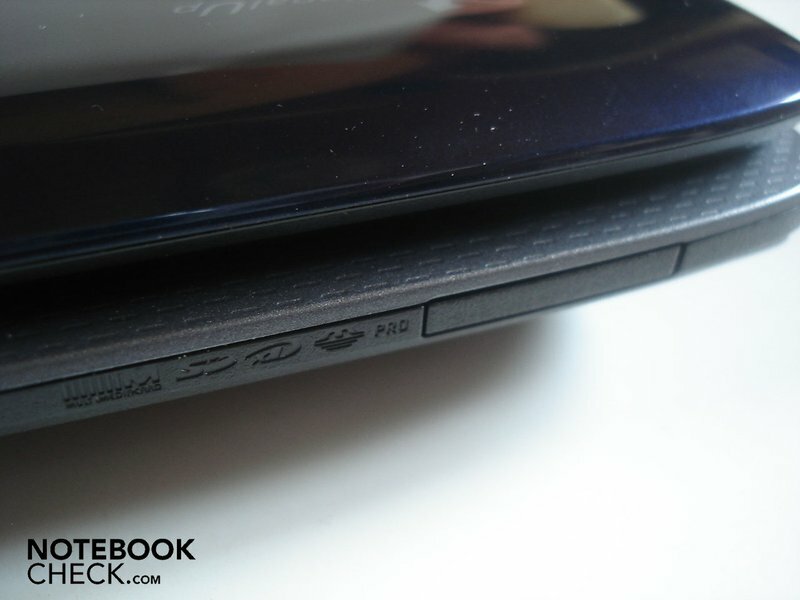 A great performance for an entertainment-oriented notebook around 800 Euro. 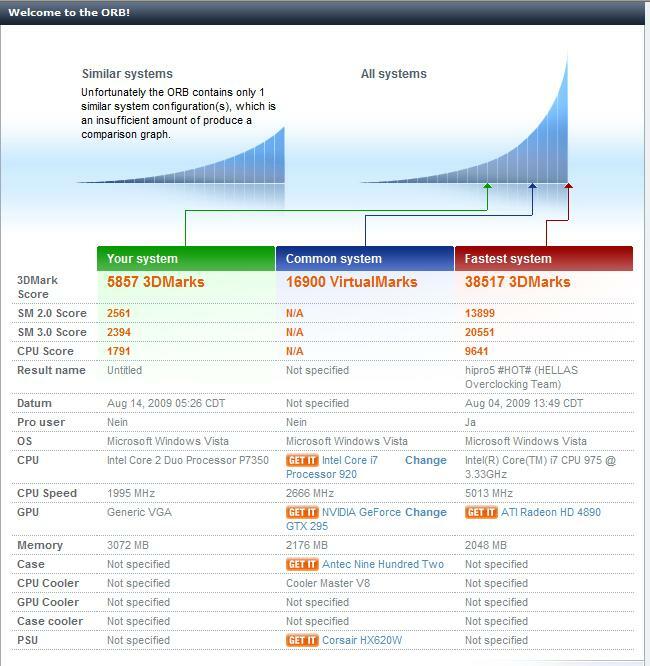 Furthermore it is shown that the GT 240M on the one hand is promoted to the new price/performance victor with Nvidia and on the other hand the "old" GT 130M is mostly mercilessly outdone. Compared to the competing card Radeon HD 4650 the GT 240M however has to make concessions, as the former mostly works slightly to clearly quicker. In this price class Nvidia still has some catching up to do. In case you are looking for more detailed information about different graphics cards and their performance, we recommend our extensive graphics card comparison and our game list. When it comes to the noise development the 5739G really isn't convincing. Thus the notebook is already very present at 35.8 dB(A) when idle. The playback of a DVD has a great influence with a high 40.4 dB(A). Under load the noise setting is in parts raised up to a loud 47.1 dB(A). Here another problem appears. Thus the fan of our test device began to unpleasantly pulsate after a few hours of loud. 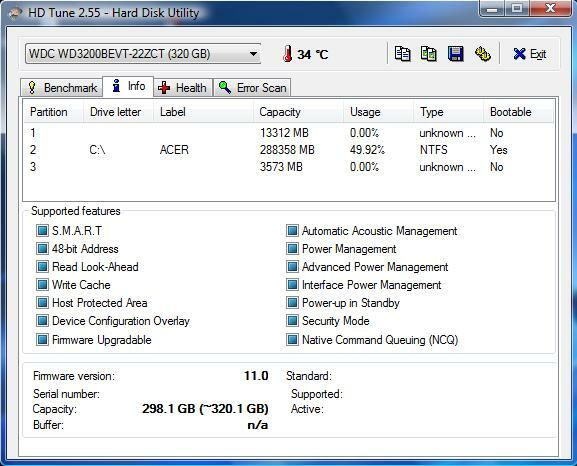 Solely the hard disk access was subjectively not discernable. 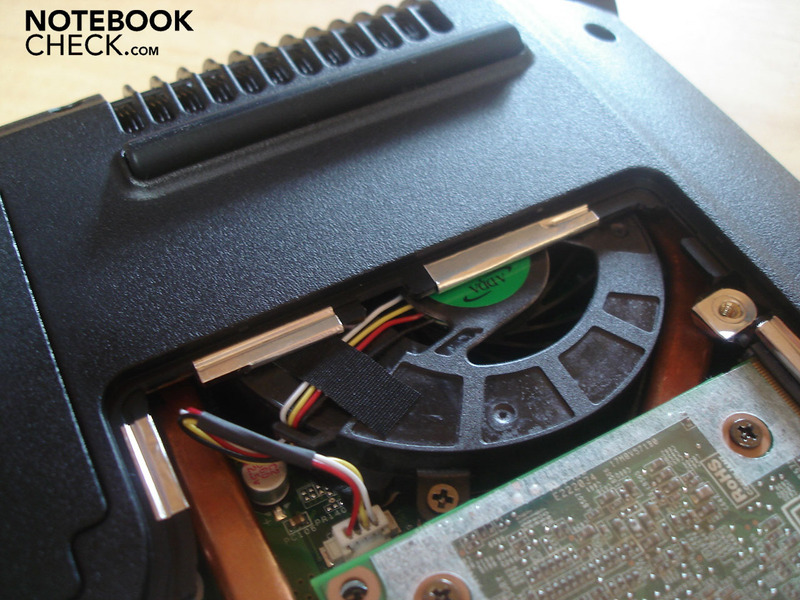 On the whole the high fan noise carries less weight during films, games and music than when working or surfing the internet, where the noise setting can become thoroughly unpleasant after some time. Also when it comes to the development of temperature the 5739G doesn't escape criticism. Thus the notebook warms up in idle mode inclusive of maximum energy saving options not only on the underside but also on the upper wise with a maximum of 29.7 degrees Celsius, which isn't really considerable. Under full load (an hour Furmark + Prime95), however, with a maximum of 44 degrees on the upper side and 51.8 degrees Celsius on the underside (in each case on the left upper area) very high temperatures are reached. Let's look at the 5739G under the bonnet. 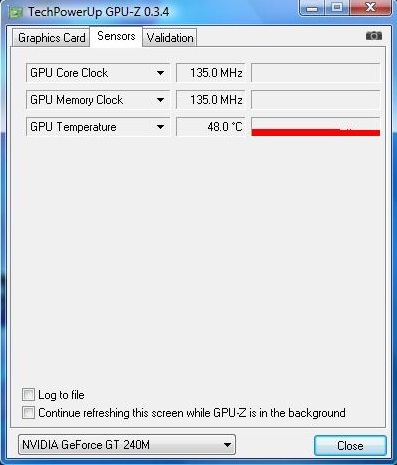 Here it's shown that the GPU is orderly cooled when idle and reaches only 45-50 degrees. Under load it indeed becomes rather hot, but not seriously so at 75-85 degrees. 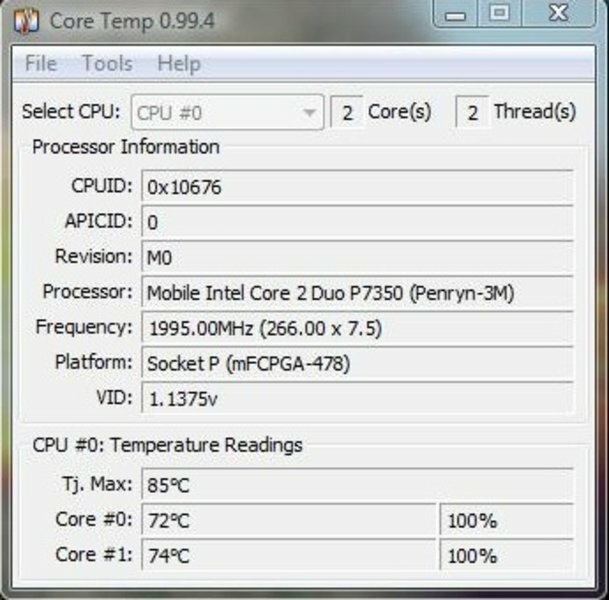 Also the CPU warms up under full load to a high 70-75 degrees. 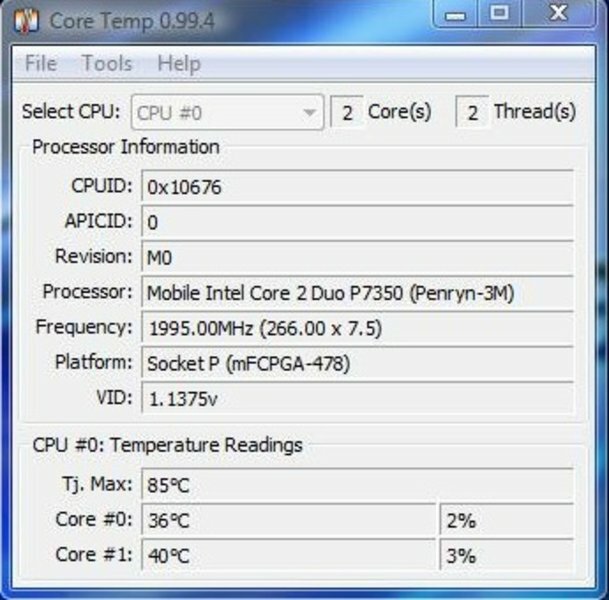 However when idle the CPU remains reasonably cool at around 35-40 degrees. 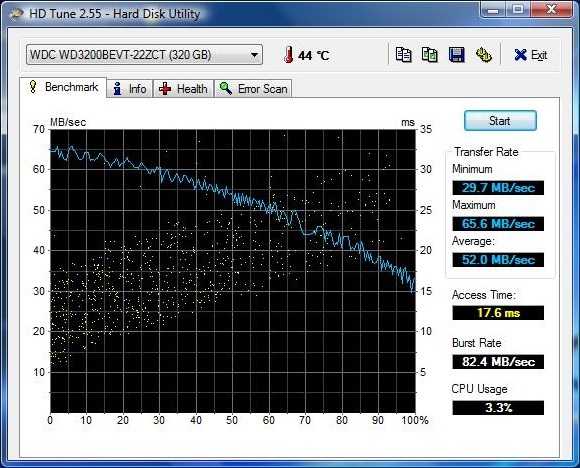 Finally the hard disk becomes warm depending on workload at between 35 and 45 degrees. 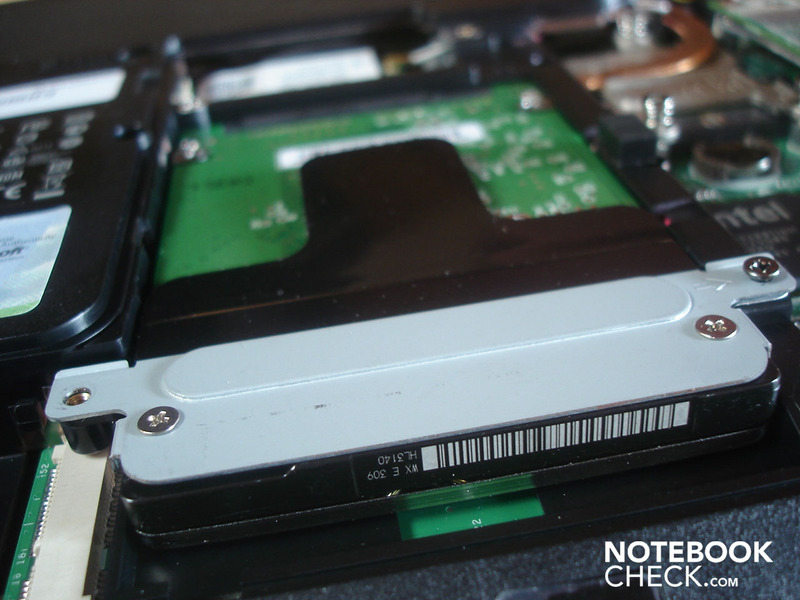 During out tests the notebook ran stable at all times. (±) The average temperature for the upper side under maximal load is 33.5 °C / 92 F, compared to the average of 30.9 °C / 88 F for the devices in the class Multimedia. (±) The maximum temperature on the upper side is 44 °C / 111 F, compared to the average of 36.5 °C / 98 F, ranging from 21.1 to 71 °C for the class Multimedia. 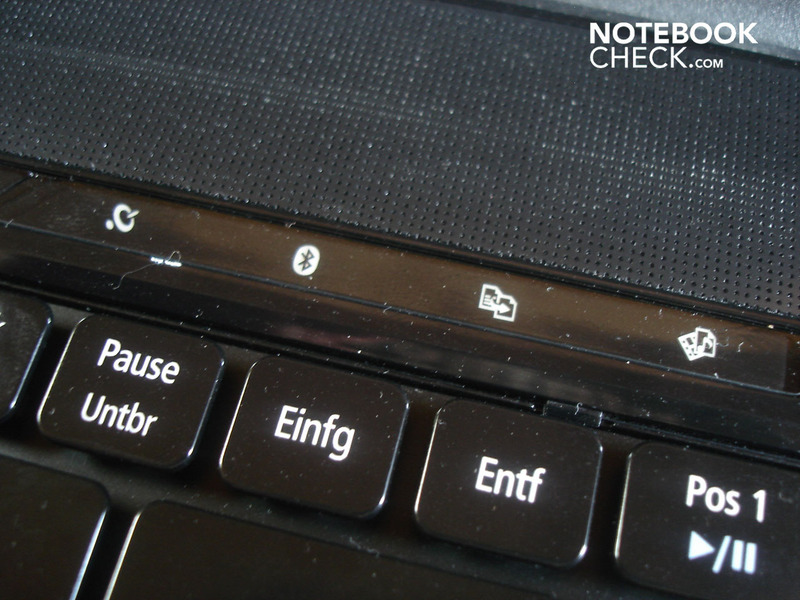 (+) The palmrests and touchpad are reaching skin temperature as a maximum (32.7 °C / 90.9 F) and are therefore not hot. (-) The average temperature of the palmrest area of similar devices was 29.1 °C / 84.4 F (-3.6 °C / -6.5 F). The thick "Tuba"-named subwoofer on the rear and the two loudspeakers affixed above the keyboard make for a convincing acoustic experience. 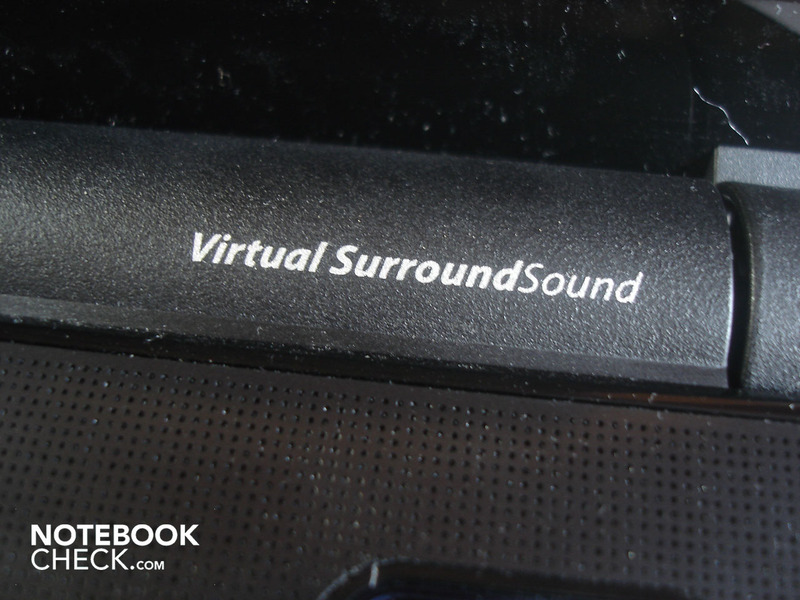 And as a matter of fact: the sound is higher-than-average for a multimedia notebook of this price class. Indeed the maximum volume could be higher, yet the rest is impressive. The different tonal regions are mostly reproduced clearly and well mixed, only the highs seem in parts somewhat fuzzy. In addition the bass is orderly discernable and present, but also intermeshed some of the time. 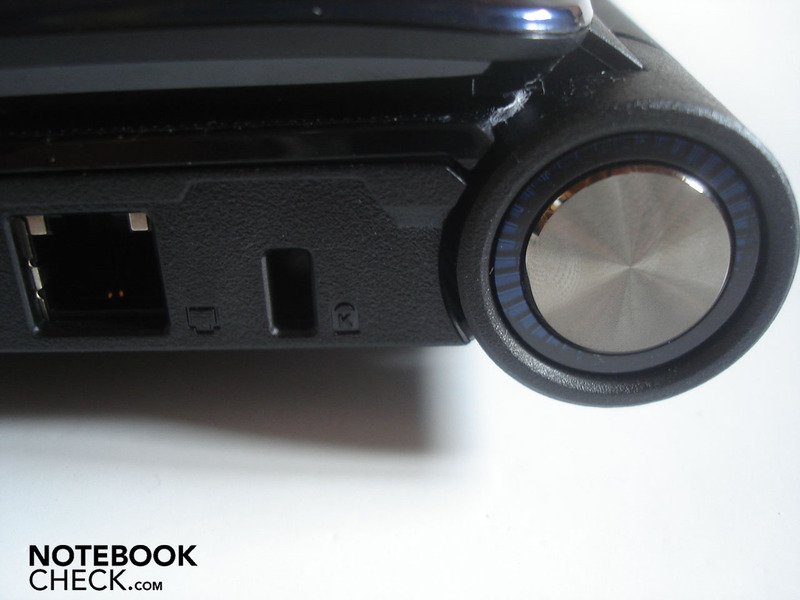 In addition the sound is on the whole slightly tinny (like almost all notebook loudspeakers). However if you connect the 5739G to an external system, the sound is once more improved, yet on the whole it seems somewhat more thumpy. As mentioned the loudspeakers could indeed be very good for a notebook, in comparison with a "real" system the 5739G can of course not keep up at all. For that reason the sound remains too faint and flat respectively and the highs too frayed. Furthermore the bass is comparatively weak and too spongy. That is, however, criticism on a high level. 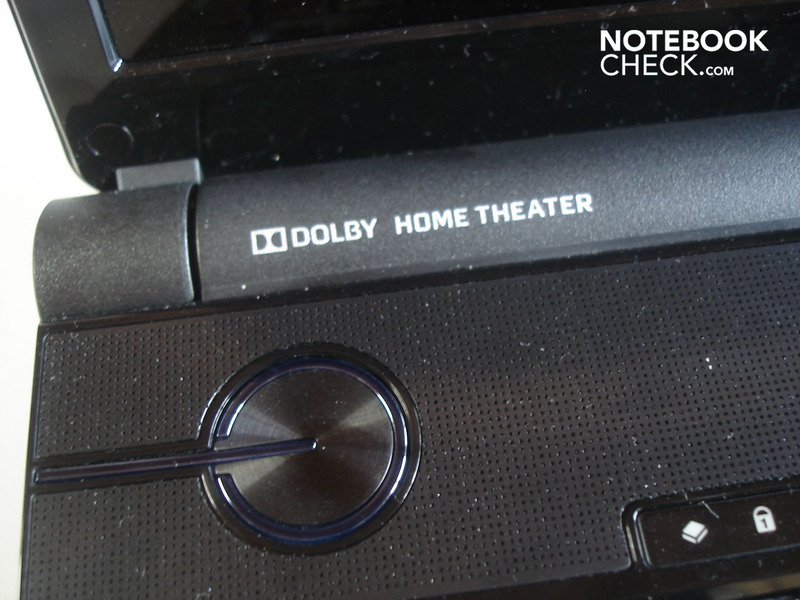 On the technical side the 5739G offers support for Dolby Home Theater and Virtual Surround Sound. 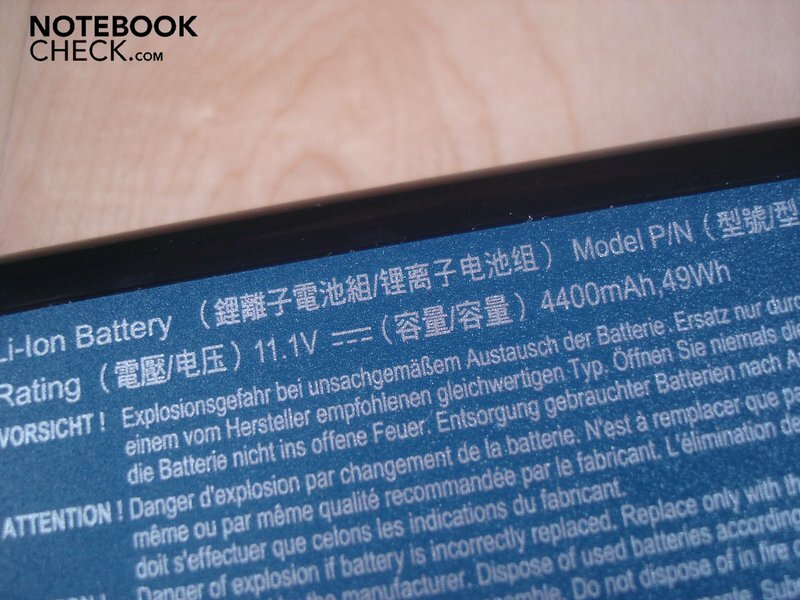 When it comes to the battery life of the six cell battery (49 WH) the verdict turns out differently depending on the area of operation. 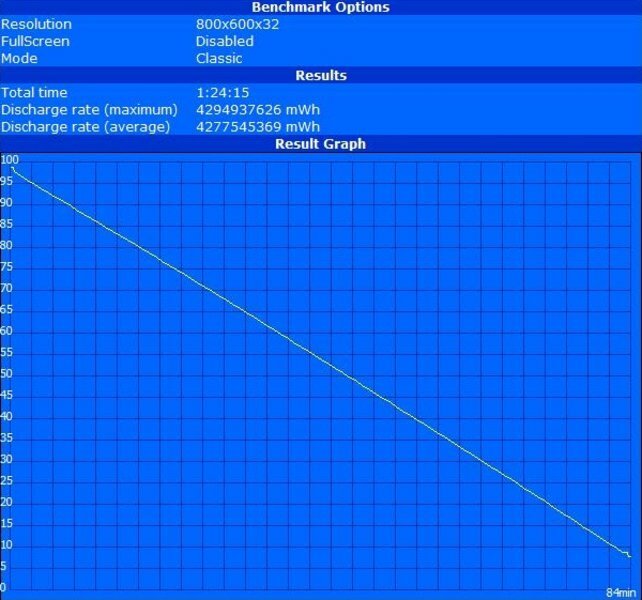 With maximum energy saving mechanisms and minimum brightness the battery life was around an orderly 4 hours and 22 minutes (Readers Test of Battery Eater). When surfing over WLAN inclusive of maximum brightness and moderate energy saving mechanisms the juice of the 5739G only ran out after a defensible 2 hours and 22 minutes. As for DVD playback inclusive of maximum brightness the notebook, however, hangs on for a meagre 1 hour and 36 minutes, which is only slightly over the battery life under full load of 1 hour and 24 minutes (Classic Test of Battery Eater). This performance is definitely too little for an entertainment notebook. However, this is where the "Acer PowerSmart" technology is brought to bear. Via a special push of a button the 5739G namely doesn't boot windows, rather a dedicated media center, which is easy to use and designed for the playback of music and video data sets and DVDs respectively. Through the "PowerSmart" mode energy is effectively saved. 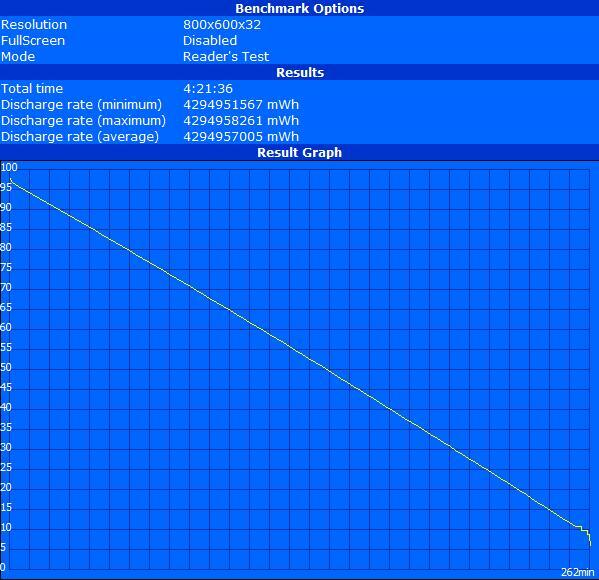 Thus the energy consumption with activated "PowerSmart" only added up to 10.7 Watt, whilst the 5739G on Windows indulges in 13.3 Watt. Under load the energy consumption is increased up to 67.2 Watt. In Standby mode it is however 0.6 Watt, whilst the 5739G in turned off condition still draws on 0.3 Watt from the power point. 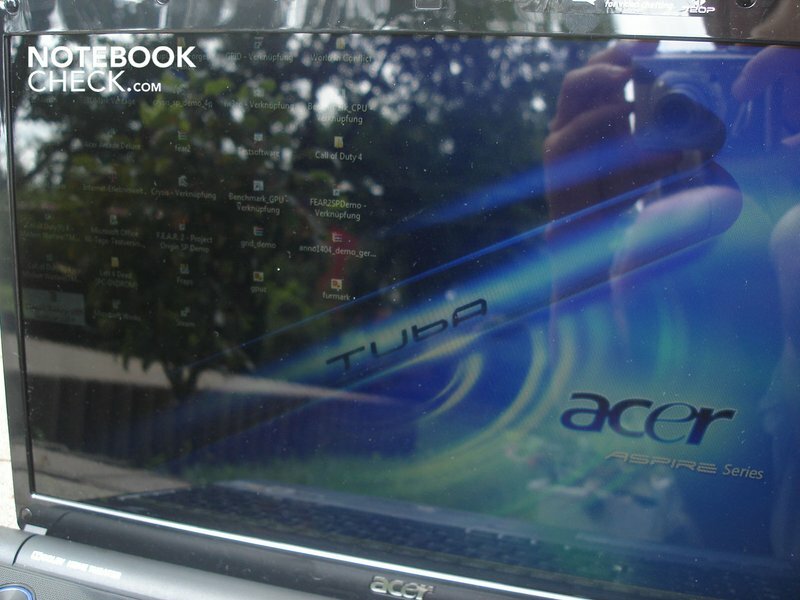 The fancy Acer Aspire 5739G-734G32Mn leaves behind a streaky impression on the whole. On the positive side there's the fine sound, the generous connection equipment, the good workmanship quality and the very good application- and respectively gaming-performance. On the negative side, however, there are the relatively high sound- and temperature-development respectively and a lukewarm battery life, which during DVD playback at 1 hour and 36 minutes turns out to be much too short. 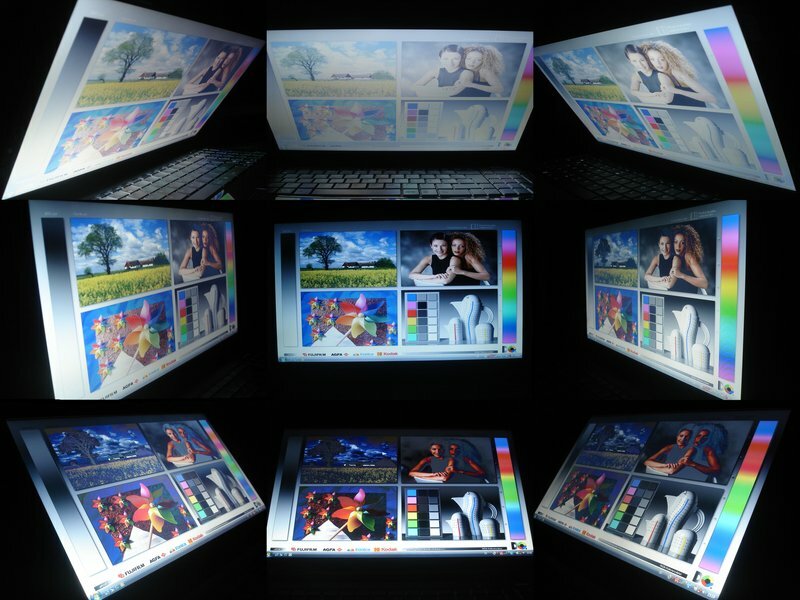 The biggest point of criticism is, however, the display with its low brightness and a rather weak contrast. In addition the touchpad wasn't really convincing. Therefore we can recommend the 5739G to all users that are looking for a powerful and price-attractive all-round notebook, which thanks to the GT 240M can also present new games in high details fluently. Entertainment enthusiasts that place a lot of value on optimal film playback and for this reason also put a lot of value on the highest image quality possible, should rather steer clear of the 5739G. 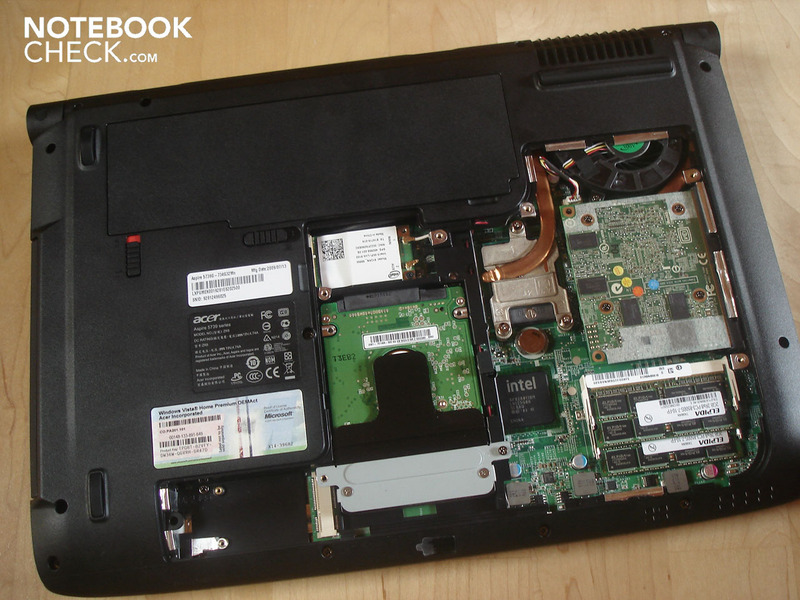 Whoever principally puts value on excellent gaming performance may equally resort to a gaming notebook with a strong graphics card with the clout of a Radeon HD4650/4670. The fancy design and the good workmanship quality. Furthermore the numerous connections that leave no wish unfulfilled. A more pleasant touchpad. In addition a lower development of temperature and noise. Finally a longer battery life, especially for DVD playback. How good the sound is and respectively the modest display. Other reasonably priced but slower entertainment notebooks like the HawkForce Mobile.Force M13.S1, the Acer Aspire 5536G, the HP Pavilion dv6, the Asus U50VG and the Asus K50IN. 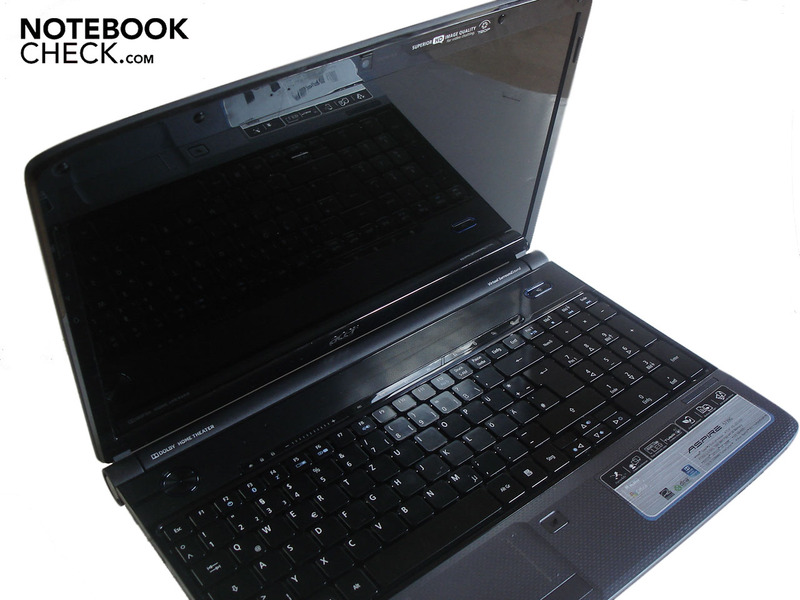 Or equally priced, attractive and faster gaming notebooks with Radeon HD 4650/4670 like the MSI GX623.